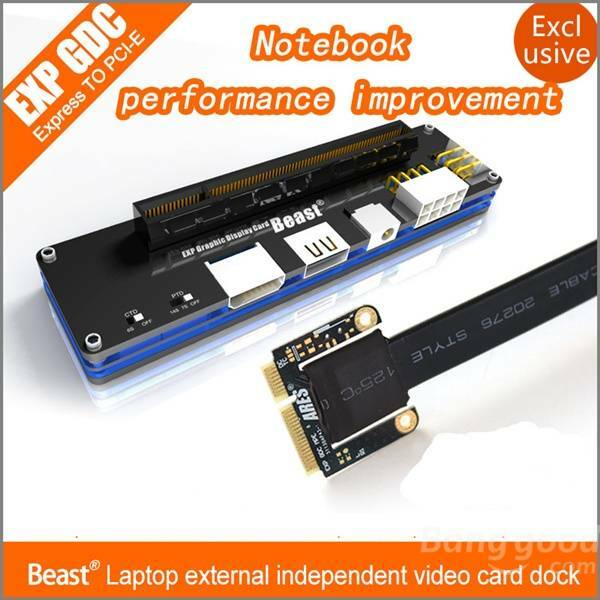 available options are:expresscard version,mini pci-e version. This video show the product is V6.0,and now the product sell is upgrade to a new version.More power and campatible but the same price. It can also use the ATX power supply. Use for engineering measurement, data collection, server debugging, GPU computing and other industrial applications, of course, still be used to access most of the graphics card to play the game. Expresscard interfaces internal to a row of contact pads 26PIN our riser card supports 54-type and 34 type Expresscard interface. Laptops released after year 2007 almost all fit EXP GDC when they have mini PCI-E slot or EXPRESSCARD slot.